Claudia Crowell at IDWeek 2018. Photo by Liz Highleyman. The researchers saw only a non-significant suggestion of an association between neurological problems and exposure to dolutegravir (Tivicay, also in Triumeq and Juluca), and none of the four affected children had neural tube defects, which were a subject of concern earlier this year. Antiretroviral therapy (ART) has dramatically lowered the risk of mother-to-child HIV transmission worldwide. But the long-term effects in children who were exposed to these drugs during gestation – most of whom do not become HIV-positive themselves­ – remain to be determined. Most previous studies have focused on congenital abnormalities and other adverse birth outcomes, not problems that may develop later on. In May, regulatory agencies in the United States and the European Union warned that women with HIV who could potentially become pregnant should not use dolutegravir, after researchers reported a higher – though still very low – risk of neural tube defects, such as spina bifida, in infants born to women in Botswana who were taking this drug at the time of conception. At the International AIDS Conference in July, the World Health Organization (WHO) issued new treatment guidelines recommending dolutegravir-based ART as the preferred first-line treatment option for adults, adolescents and children, including women with access to reliable contraception. Women from Africa made it clear that they did not want their access to this effective and well-tolerated medication to be limited because of only four cases of neurological birth defects. At IDWeek, Claudia Crowell of the University of Washington and Seattle Children’s Hospital presented findings from an analysis of 3747 HIV-negative children born to HIV-positive women in SMARTT (Surveillance Monitoring for ART Toxicities), an observational cohort study conducted by the Pediatric HIV Cohort Study network, which includes 20 sites in the United States, between 2005 and 2017. About 70% of the children were black, 26% were white and 31% were Hispanic. Most were enrolled at birth and they were followed for the first two years after birth or study entry. Exposure to protease inhibitors was most common (70%), followed by non-nucleoside reverse transcriptase inhibitors (19%, including 4.5% exposed to efavirenz) and the newer integrase inhibitors (11%, including 2.6% exposed to dolutegravir). Most of the mothers (87%) had viral suppression (< 1000 copies/ml) and well-preserved immune function at the time of delivery. Tobacco, alcohol and illicit drug use were reported by 17%, 8% and 9%, respectively. The researchers used tracking forms and head circumference measurements to identify suspected cases of neurological disorders, which were reviewed by experts who did not know whether the child had been exposed to antiretrovirals. Out of the 3747 evaluable children, 237 were diagnosed with 287 neurological conditions, a prevalence rate of 6.3%. The children were two years old, on average, when neurological problems were confirmed. Half of the conditions were diagnosed after age two, demonstrating the importance of longer-term follow up. Microcephaly, or small head size, accounted for a quarter of the disorders, followed by febrile seizures (18%), eye abnormalities (17%), non-febrile seizures or epilepsy (13%), and various uncommon conditions occurring in 5% or less. Overall, the strongest risk factor for neurological abnormalities was tobacco use, especially during the first trimester, which nearly doubled the risk of neurological problems. Use of alcohol or illicit drugs were no longer significant after adjusting for tobacco use. Among the children with neurological disorders, 16 had been exposed to efavirenz. The prevalence in this subgroup was 9.6%, compared with 6.2% for those not exposed to the drug, indicating a 60% higher risk. The overall association did not quite reach statistical significance, but it did so in various sensitivity analyses adjusting for factors such as duration of follow-up and presence of congenital anomalies. Previous studies have not seen a link between efavirenz use and adverse outcomes at birth, but did not look at longer-term developments. The study also saw a "suggestion of an association" with dolutegravir, but this was not statistically significant. Only 94 children were exposed to this newer drug, of whom four were diagnosed with neurological problems – none of which were neural tube defects of the type seen in the Botswana study. 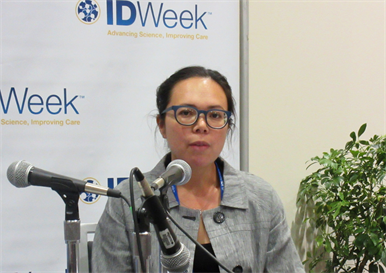 "We need larger cohorts, with more children exposed to newer agents, and we need to continue to follow them to find out the long-term clinical implications," Crowell said at an IDWeek press briefing. "We still haven't determined the best antiretroviral regimen in pregnancy." Crowell C et al.Safety of in utero antiretroviral (ARV) exposure: neurologic outcomes in HIV-exposed, uninfected children.IDWeek, abstract LB5, 2018.